The holiday season is just around the corner! Candlewick Press have some fantastic Christmas themed picture books for you and your family to enjoy during this season. 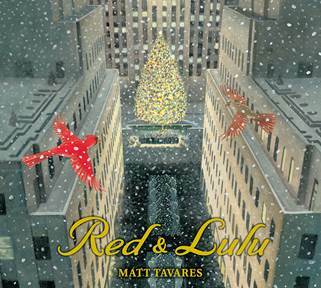 About the Author: Matt Tavares is the author-illustrator of Crossing Niagara, Henry Aaron’s Dream, There Goes Ted Williams, Becoming Babe Ruth, and Growing Up Pedro, as well as Zachary’s Ball, Oliver’s Game, and Mudball. He is the illustrator of ’Twas the Night Before Christmas, Over the River and Through the Wood, Lady Liberty by Doreen Rappaport, The Gingerbread Pirates by Kristin Kladstrup, and Jubilee! by Alicia Potter. Matt Tavares lives in Ogunquit, Maine. About the Author: Patricia Toht once owned a children’s bookshop called Never Never Land before turning a love of books into a love of writing. 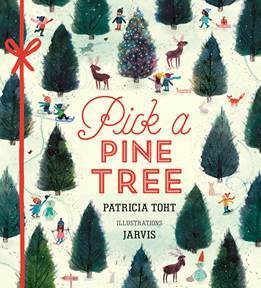 Pick a Pine Tree is her debut picture book. Patricia Toht lives in Chicago, Illinois. About the Illustrator: Jarvis is an illustrator and animator who has worked as both a record jacket designer and an animation director. He is the author-illustrator of Alan’s Big, Scary Teeth. Jarvis lives in Manchester, England. Bear’s minimalist holiday celebration has an eager Mouse feeling a bit anxious in this humorous and heartwarming story about the unlikely, lovable pair. One frosty night, Bear hears a tap, tap, tapping on his front door. “Merry Christmas!” cries Mouse. Mouse is there for a Christmas party, and Bear has never had one before, but he’s certain that pickles (preferably from France) must be an essential component, along with the reading of a long and difficult poem. The problem is, whenever Bear comes back from the kitchen with more treats, Mouse has vanished — only to be found, small and gray and guilty-eyed, scurrying under the bed or rifling through the closet. Will there be even a tiny present involved? “Hogwash!” scolds Bear. Get ready for holiday anticipation and the best kind of surprises as the curmudgeonly Bear and a hopeful Mouse return in a warm, funny tale full of holiday cheer and true friendship. 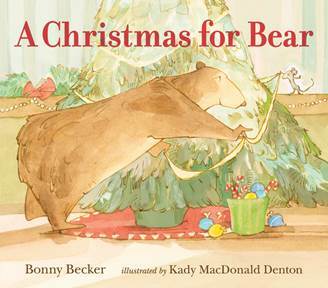 About the Author: Bonny Becker is the author of several books about Bear and Mouse, including the New York Times bestseller A Visitor for Bear. She is also the author of a number of other award-winning titles, both picture books and middle-grade novels. She lives in Seattle. About the Illustrator: Kady MacDonald Denton is the illustrator of many books for children, including the Bear and Mouse books, as well as Two Homes by Claire Masurel. Kady MacDonald Denton lives in Ontario. The anticipatory excitement of Christmas Eve builds in a festive way in this follow-up to the much-loved Ghost in the House. There’s a girl in the house on this snowy Christmas Eve. Creeping down, step by step, here she comes. And the only thing that’s left is . . . CRUMBS! Follow a child on a most magical night as she looks for the source of the sound that woke her up. In a lively, cumulative story full of page-turn reveals, all is not what it seems. While the little girl searches the house, she encounters some unexpected new friends. But the biggest surprise is sure to come last! 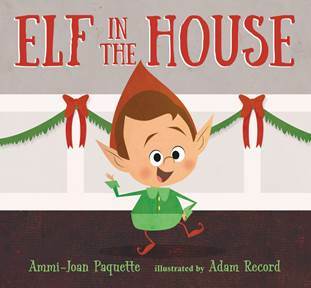 About the Author: Ammi-Joan Paquette is the author of many books for young readers, including the spooky picture book Ghost in the House. 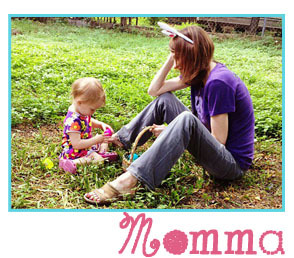 In addition to her writing, she is a literary agent representing authors of children’s books. She lives outside Boston with her family. About the Illustrator: Adam Record started doodling on a bench in church and now gets inspired by old children’s books and vintage posters. He lives in Utah with his wife and three children. Clara’s dream is to become a Christmas fairy, whose job it is to stay still atop the tree. But when Christmas lesson time rolls around at fairy school, things don’t go quite as planned. Clara’s so excited that she can’t possibly be still and quiet like a fairy should. Although she tries her best, at heart she’s still a wriggly, giggly chatterbox who likes nothing more than making people smile. But when it’s time for the big Christmas Show, it looks like that’s exactly the kind of fairy Santa needs to help him save the day. At last, Clara can put her talents to good use, and it soon becomes clear that there’s more than one way to be a Christmas fairy! This rhyming text from the pair behind The Fairiest Fairy is sure to have readers in a festive mood. About the Author: Anne Booth is the author of The Fairiest Fairy. She lives in Kent, England, with her husband, four children, two hens, and two dogs. 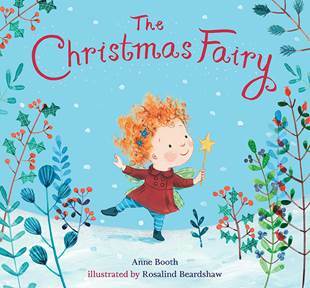 About the Illustrator: Rosalind Beardshaw is the illustrator of many books for children, including The Fairiest Fairy, Box, and Just Right for Christmas. She loves creating new characters, especially if they can be based loosely/wholly on her dog, Basil. She lives with her partner and children in York, England.